This body of works consists of thirty drawings (pencil, color oil pastel, ink), twenty photographic polyptychs and three videopieces. Photos polyptyques C-Print. Edition of 9. Videos (Master NTSC, 3CCD, auto-start DVD ): Tree, my friend, Five Days, Brushy, my love. Edition of 9. This body of work was developed over a three year span. It belongs to this presentation, as suggested by my professor of new media at Temple University, Sarah Drury. She sees it as a rich exploration of concepts and narrative modes, and as a source in the development of a personal vocabulary. Different motives used in my more recent works can be traced back in the Blax series. For instance, the importance of color, the different levels of reality mixed together, the way images are selected with care and organized in a non rational way, the use of all the senses in the perception process to describe an apparently plain reality. All these structural modes have been developed and emphasized in the more recent artworks. The series evokes the daily urban environment in a playful way. A character, which face is covered by a black mask (why? ), discovers the world around him and describes his interactions with other human beings and with the natural environment within the city. By doing so he reenacts our day-to-day routines and reveals the beautiful and subtle events he comes across. The world gains back its magic. The viewer understands that the character could be an allegory of melancholy, and his actions a metaphor for the healing process in progress within him. And on a more conceptual level, it becomes clear that the deprivation of the senses possibly experienced by the character, opens a space for perceptive interactions that build up the narrative process. The mundane dimension of the series is reinforced by its installation, with TV screen and chairs creating an unformal settings, a coherent sobriety. The contrast between the mask and the descriptive realism around him, the logical gap between the implied blindness and the cinematic situations moving towards the absurde when the character takes action, all create a dynamic tension between levels of reality. All these modes have been ever present since in my works. 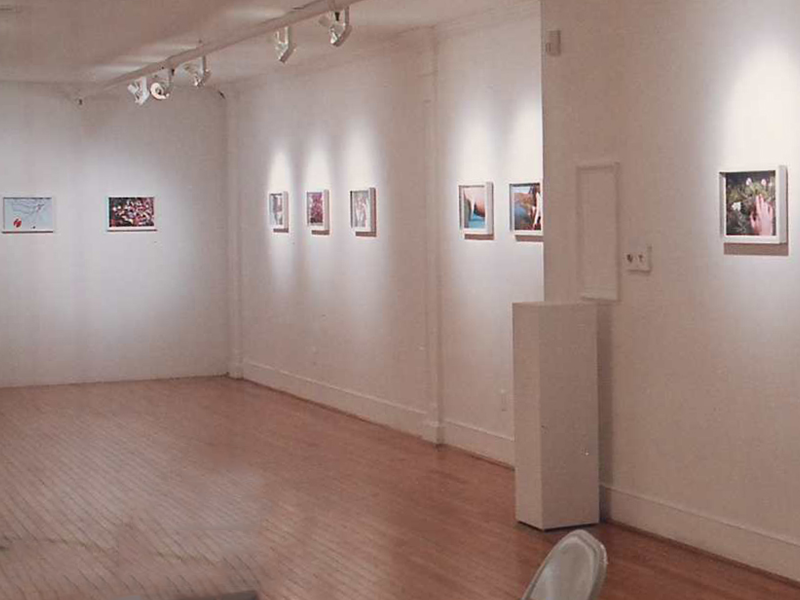 Nikolai Fine Art Gallery – New York, USA (2001) : « Winter Retrospective » Video Screening on TV + one polyptych. 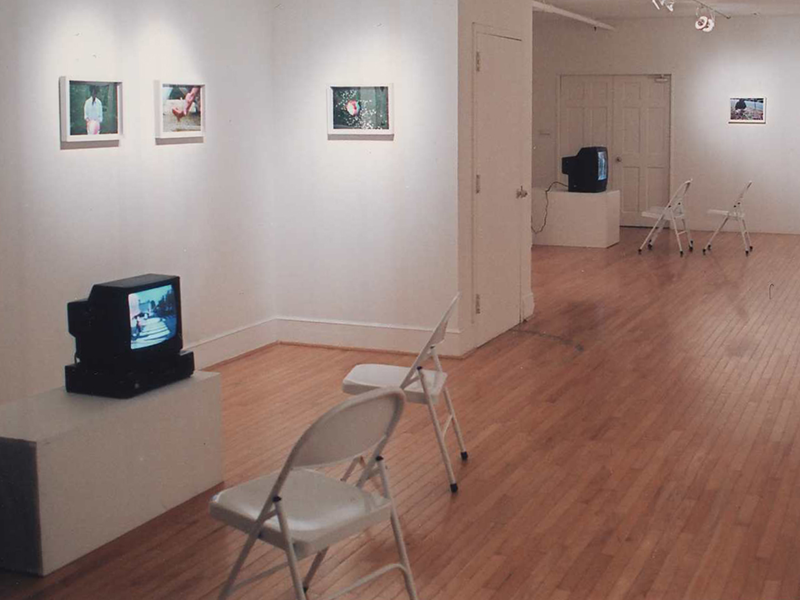 Tyler Gallery, Center City, Philadelphie, USA (2000) : « Blinding Beauty » Site specific installation : 2 Video Screening on TV, looped to create a sound surround in the exhibition space + 20 pictures installed in line on the sourrounding walls , at 1m70 high (6 ft heigh) like panoramic windows. This installation was my MFA's thesis show at Tyler School of Art.